It’s not all sunshine and rainbows being in a team building planning committee. Here are a few unconventional solutions to challenges you might face along the way. Griness has learnt them the hard way – by facilitating over a thousand events all over Asia. 1. Make lemonade out of lemons. If you happened to be arrowed… I, mean, assigned to be part of the team building planning committee, it means two words – extra work. You cannot avoid it, but you can turn the problem into opportunity. As part of the committee, you get direct access to VIPs and VVIPs during the overall planning, when they provide event objectives and budget directions on the options proposed by your committee, and on the event day. You get an exclusive chance to showcase your strong leadership and project management skills, in front of your higher-ups, who will then probably remember it. If your objective is to have fun, and you want to measure success of your event in decibels of laughter, just say it. Don’t make up ‘chim’ sounding objectives if you don’t have a genuine need. Just having a great time together is great. Reinforce corporate values: Present your corporate values in an engaging way. Learn specific skills: Corporate soft skills like creative problem solving, decision making, conflict resolution, etc. Mindset change: Being open to change, accountability, cross-departmental collaboration, etc. Build internal networks: Let your staff and colleagues connect with each other on a personal level, and know the person behind that job function. Spend your welfare budget: Finish off your budget for the year-end closing of accounts. 3. Thank God, it’s Monday! 90% of all team building events are held on Fridays, so that participants can enjoy an extended weekend. But is there a downside to it? Most popular venues are booked on Fridays. Even if they are available, they won’t be as willing to negotiate rates, and accommodate the budget for your team building event. That means higher budgets for the same deal. Is it really worth it? In this case, you might want to use Monday instead, since it will be still be considered an extended weekend, and you can start your working week right after, pumped up and in a great mood. If you want to build anticipation and ensure high attendance, start promoting the event in advance. Go beyond emailers. Create an internal competition before the event starts. Split attendees into cross-departmental teams and get each of them to come up with creative selfies, team identities, and costumes, e.g. vintage-style team photo contest prior to The Seven Wonders Of Singapore game. What to do when half of your team is keen to enjoy outdoors, while the other half must be ‘kept refrigerated’ in an aircon room? Compromise. Instead of beach games, high elements and cross-island Amazing Races, you can choose to have outdoor games that are conducted in sheltered outdoor locations, e.g. our The Running Man Race in Resort World Sentosa. Or a race inside shopping malls like our popular food hunt, We Are Omnivores. If your department is too small to afford team building activities (5-10-15 people or less), what team building companies and venues will charge you will be unreasonably high. 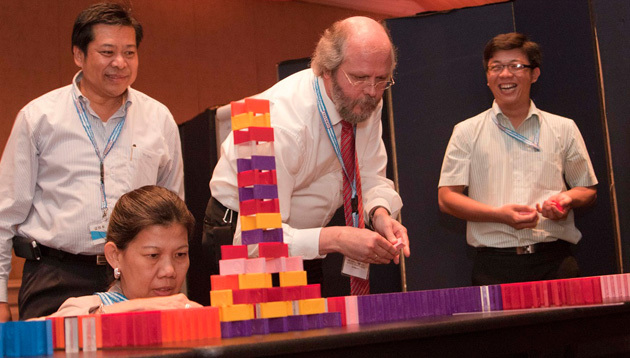 One of the ways to solve it is to combine team building with other departments, or two of the same size. You can bring this idea to the next level and invite key clients and vendors to join your team building event as well. We’ve learnt about it from our client, a shipping company that entrusted us to facilitate one of its yearly team bonding events for staff and clients – the Bizarre Beach Olympics in Sentosa. It is not difficult to find a team building vendor. Just Google ‘team building event Singapore’ and you will find 30 websites that look fantastic! The downside? You’ve found 30 ‘number 1 team building company in Singapore’ – at least, that’s what they advertise. So what do you do? How do you find a reliable vendor? Ask vendors about VIP events and long-term contracts. Why are you asking for this? Because these guys will do the evaluation in advance for your business (the much needed due diligence, saving time for you). For example, one of the largest companies in Singapore in the property market recently appointed Griness as its official team building vendor. The process of evaluation took six months, and Griness was analysed from all aspects that you can (or cannot) imagine. Some criteria included: having similar contracts in the past, having facilitators with at least five years of experience, checking up on references, attending our events and so on. 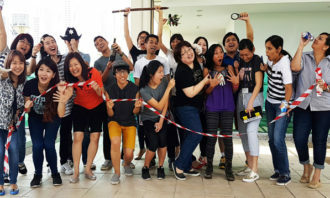 We, at Griness Teambuilding Singapore, have compiled our years of knowledge after holding hundreds of team building events, to come up with a comprehensive guide that walks you and your HR department through the entire process of planning, budgeting, and holding a team building event that is memorable for years to come.